Walking down Portal del Angel street you get to the intersection with Carrer dels Arcs. There is a small building over there called Palacio Pignatelli which holds the Reial Circle Artistic (Royal Artistic Circle). This entity was founded in 1881 although its royal category was granted by Alfonso XIII in 1926. The aim of this non-profit organization is to gather all those persons interested in Fine Arts and support them in their creative experience. The place has held many important exhibitions in Barcelona. 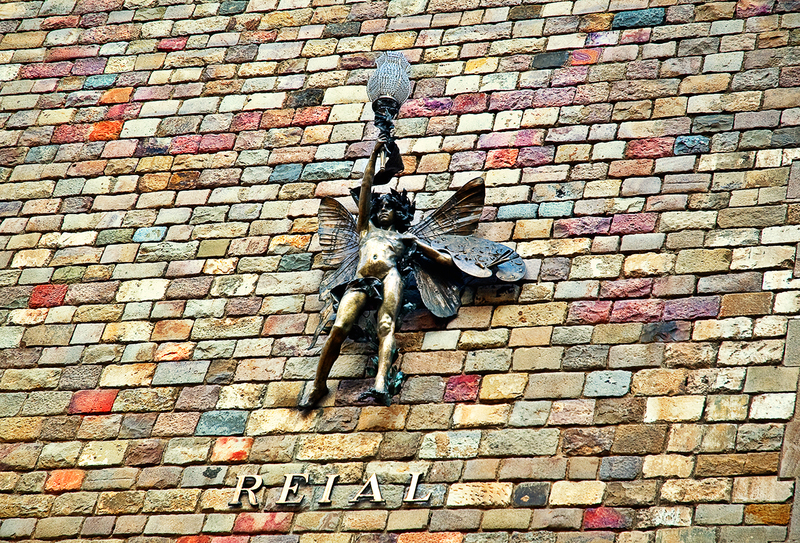 But I only wanted to show you a detail of the beautiful figure on its facade. I have thought of you since the terrible plane disaster yesterday, and pray that you and family/friends are all safe. I read that the flight originated in Barcelona. Many are thinking of Spain with loving hearts. This picture: yes, the figure is astonishingly beautiful. But most of all I love the colored bricks! I have never seen bricks so wonderful. Is there a story behind the making of them? Thanks Lydia for being worried about my family and friends. Fortunately we are sound and safe. We arrived the very same day of the tragedy, although the accident happened in Madrid airport. We came directly from Philadelphia. It was sad to hear the news and we were very affected and scared after having been on a plane that morning. We even met a woman who was supposed to go to Madrid and then to the Canary Islands. She was accompanied by her son. We remember the name so we examined the list of casualties but fortunately he wasn't there. Perhaps they took an earlier flight. There are rumours that everything came out of someone's negligence. Things like that should never happen. Thanks for your kind words.